A veteran of the US Army put his sharpshooter skills into practice in a bid to set a trapped eagle after the 4th July holiday. Jason Galvin, the Army veteran was on a run for picking up some minnows when he noticed the bald eagle on the tree. It dangled upside down from a tree branch, about 70 feet above his head, near a cabin belonging to the Galvins. The majority of the locals in Minnesota had already made an assumption that the bird was dead. After Galvin had used his binoculars to take a closer look at the bird, he realized that it was still alive. 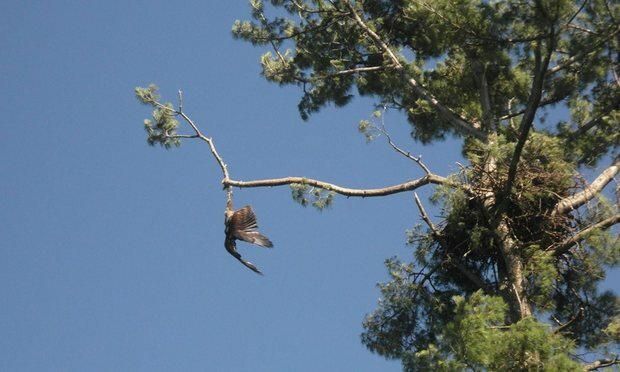 One of the eagle’s legs had been trapped on a rope which was tied to the tree branch. Even after calling the Minnesota DNR, the police and the fire department, they were all unable to help it because it was too high up. Jackie, Jason’s wife indicated that they had all been made aware of the situation for more than two days. Unfortunately, all the emergency help authorities that were called upon said that it was not in their jurisdiction. Jackie knew that the eagle’s life was hanging on a thread and since the authorities were not able to offer a helping hand, she asked her husband to shoot the rope. Jason Galvin who served two tours of duty in Afghanistan as a sharpshooter borrowed a scoped .22-caibre rifle for severing the 4-inch rope which had tangled the eagle’s leg. After seeking approval from the Minnesota DNR, he got down to some serious life-saving business. Galvin was given the go-ahead by Phil Mohs, the department’s conservation officer who believed that the eagle would end up dying in the tree if it were left alone. Jason said that it felt a little weird shooting in the eagle’s direction and he was quite nervous. ‘‘I did not want at all to hit that bird.’’ He said. In the mid-afternoon sunshine, Jason battled the branches and leaves of the tree. He had to bust down a number of branches so that he could adequately expose the rope that held the bird’s leg. Shot after shot, he tried to break through that rope. ‘‘I took an hour and a half, and about 150 shots.’’ Galvin said. This was quite impressive especially since none of them even grazed the eagle. At the end of it all, he managed to sever the 4-inch rope and it fell through the tree from which it was hanging. The eagle fell about 70 feet to the ground and it was wrapped in a blanket by one of the locals who worked at a conservation center nearby. The neighbor then took the eagle to the Raptor Center at the University of Minnesota. The Galvins named the eagle freedom and the hoped that they would release it to its natural habitat once he recuperated. One of the vets at the Raptor Center said that the eagle was feeding well and even though the long-term prognosis wasn’t quite clear, it is expected to make a full recovery.